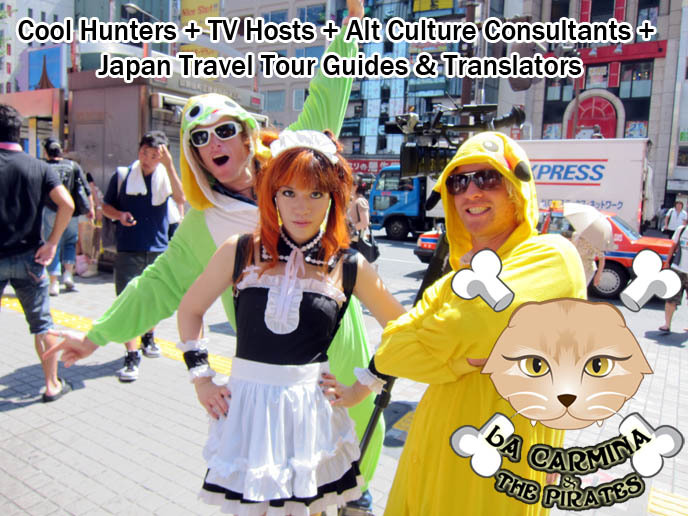 HIRE A JAPANESE TV ARRANGER, PRODUCTION COORDINATOR, TRANSLATOR, ON-CAMERA HOST & GUIDE. COOLHUNTING FIRM. Ahoy, me hearties! Ye be ready for a jolly announcement? 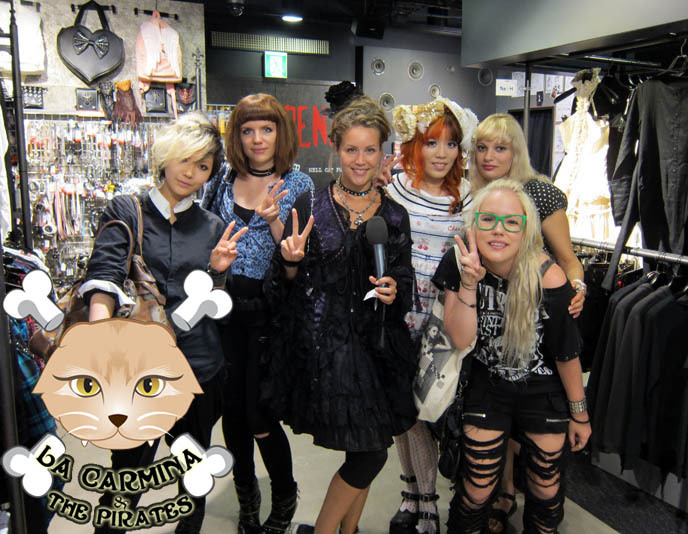 I’ve officially launched a Japanese alt / trend consulting business with my friends: La Carmina & The Pirates. Translating, connecting, coolhunting, arranging for TV crews — we do it all. As you know, I’ve been working as a TV host and “fixer” (scheduling TV shoots) in Japan for some while. So my First Mate and I decided to set up a proper website to showcase our experience and services. Naomi Rubin is fluent in Japanese and a pro at scheduling/negotiating, making her the ideal mate to steer this ship. Her many talents included designing the handsome Pirate Basil logo! 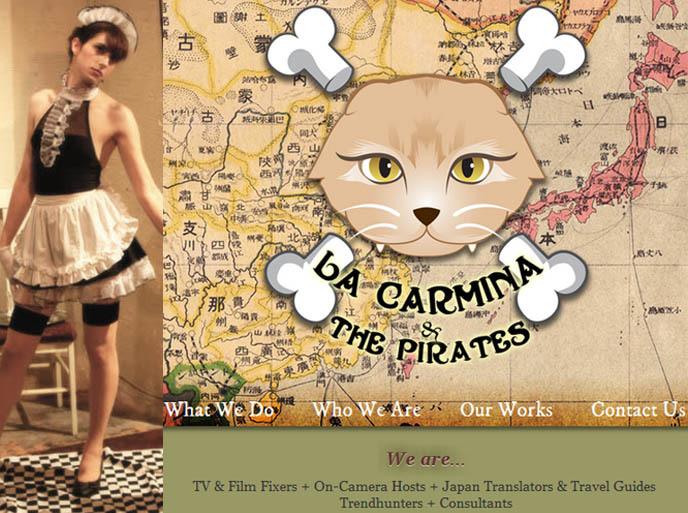 Why hire La Carmina & The Pirates? † We’re active participants in alternative youth subcultures: including cosplay, Goth, burlesque, LGBT, Jpop culture. So we’ve got the insight. Connections. Professional experience. We’re experts in Japanese trends, language and business formalities. † Japan is notoriously difficult to access and film. As local production coordinators (fixers), we’ll take care of shooting permits, logistics and negotiations. 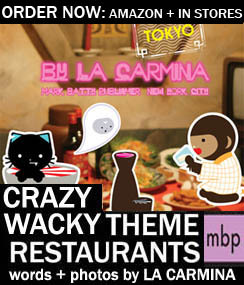 † La Carmina is a colorful TV host, author of 3 books, and popular blogger. As an on-camera guide,she can conduct interviews and speak knowledgably about trends. † We’ll reach out to famous designers, artists, bands and fashionistas to be in your project. + We will promote your company to our large social network and blog audience worldwide. † Cool hunting: we provide insight into underground cultures and trends. No pirate ship is complete without a Crew. Naomi and I work with reliable team of “pirates” that provides expert insight and access. You can watch a reel of La Carmina’s TV hosting and arranging experiences above and here. These include CNN, NHK, Today Show, Anthony Bourdain No Reservations, Bizarre Foods with Andrew Zimmern and Dutch Pepsi. Full clips of all videos are on the new Pirates site. Please take a minute to visit the new La Carmina & The Pirates website – we can’t wait to hear what you think. Can you think of any companies or individuals who might want to work with us? Please let us know, and keep us in mind for future projects! CUTE FACED RAINBOW CUPCAKES VIDEO. ADORABLE PANDA & BEAR FACE DECORATIONS WITH CANDY AND ICING. Paperlilies posted a video, exhibiting her homemade cupcakes that are cute inside and out! She used a rainbow cake recipe, which gives the interior a psychedelic swirl. She turned the surface into the faces of Japanese-style bears and pandas with icing and candies. There are more photos of the cupcakes on her Flickr. CUTE CUPCAKES VIDEO, RECIPES FOR MAKING FAIRY AND HOBGOBLIN CUPCAKE DESSERTS. FUNNY JAPAN COOKING TV SHOW, CREATIVE FOOD DECORATION. Four words. New. Death. Cookbook. Video. La Carmina and Kojin, the inflatable bear / kitchen god, challenge the southern transsexual Cotton Bale to a Cute Cupcake Duel. Who will prevail: hobgoblin or fairy cupcakes? Will Kojin make it out of Japan alive? This hilarious video was filmed in Tokyo and includes full recipe demos. Stay tuned for the bloopers and extras. I think this is the tightest episode yet. Can’t wait to make the next one! What was your favorite part of this video? What would you like to see on the next Death Cookbook episode? CUTE YUMMY TIME: KAWAII COOKING VIDEOS. SHAPED BENTO EGG MOLDS, ANIMAL PANCAKES. I’m bursting to show you Cute Yummy Time – but patience! You’ll have to wait until it’s released in November 2009 by Perigee/Penguin Books USA. 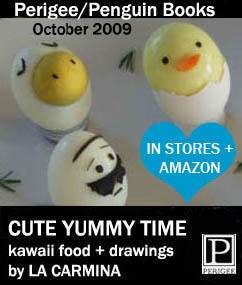 Here, Basil Farrow and I show you how to make cute heart and star-shaped hardboiled eggs… using bento molds from Japan! Who would have thought of that? Halfway though the video, my kitty steals the show. You’ll see much more in our upcoming recipe book, Cute Yummy Time.